This adorable quilt/wall hanging and flag embroidery Cd and pattern is a must have for all those gnome lovers. These cute guys have optional faux fur beards and they bring lots of Tulips to help you celebrate Easter or Spring. This pattern can be used to make flags, table runners, quilts, wall hangings, totes and more. 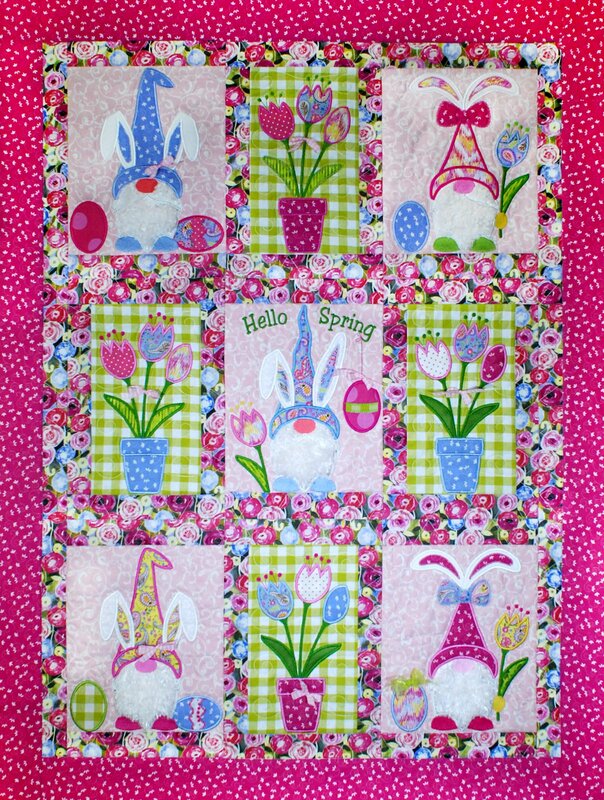 Not happy with our quilt size, this quilt is easy to enlarge, just add blocks and borders!! This Quilt shows at a finished size of 37" x 49" using a 9 1/2"x 14" hoop. It also comes for the 8"x 12" hoop, the finished quilt will be 31"x43". With this flexible design you can make it any size you like! Don't miss out on our early, soft release now as a download only! You can have it made this year just in time for Easter! The finished quilt is shown in my Flamingo Fantastico fabric line to be released to the public July 2019 by Quilting Treasures.